Here’s All You Should Know About The JNU Protest | CurrentBuzz! and what made it turn so ugly. #1. The students of JNU were protesting against the killing of Afzal Guru and for the struggles faced by Kashmiri migrants. #2. For the protest, there were multiple posters pasted in the campus inviting students for their participation. #3. The protest was to be held by a programme “A country without a post office — against the judicial killing of Afzal Guru and Maqbool Bhatt”, an event which included poetry, art and music. #4. 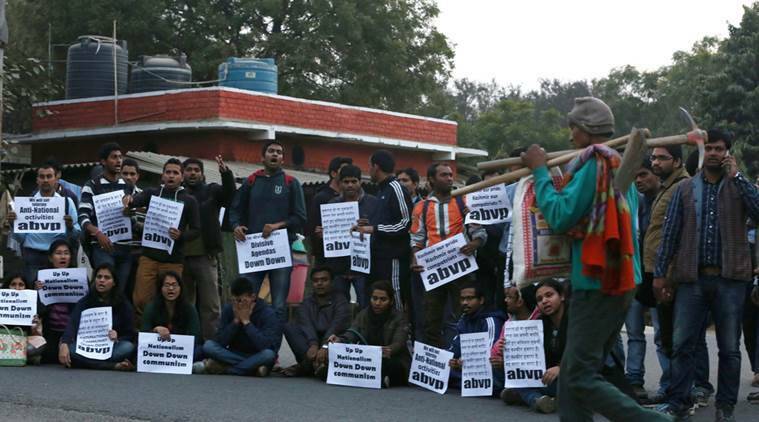 The representatives of ABVP (Akhil Bharatiya Vidyarthi Parishad) were not really happy with the protest and its nature, and hence held a protest against the students of JNU, demanding an expulsion of the participants and asking the authorities to take a disciplinarian action. #5. The members of ABVP alleged that the students were shouting ‘anti – India’ and ‘pro – Pakistan’ slogans which infuriated them. #6. 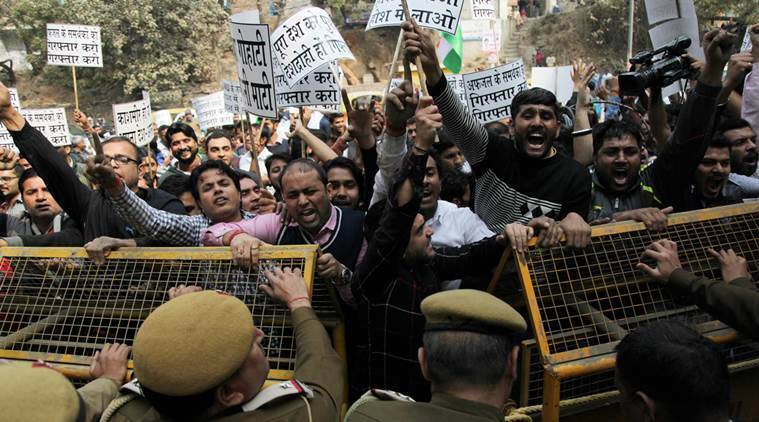 However, the students of JNU participating in the protest denied shouting any anti- India slogans. They added that the event was more of a cultural programme with a cause to bring the plight of Kashmiri citizens on the forefront. #7. 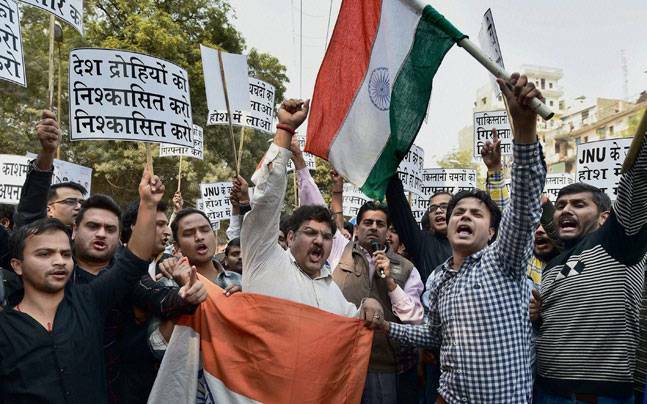 There were sedition charges lodged against some students of JNU. 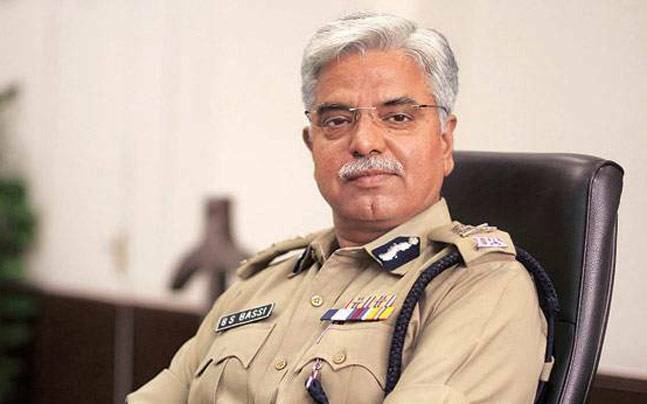 The University too took a strong action by prohibiting eight students from engaging in any academic activity till the enquiry reached a conclusion. #8. The Students Union President of JNU, Kanhaiya Kumar was arrested for the ‘anti-India’ slogans. #10. With the Freedom of Expression taken away from the students, they reacted to the police crackdown by boycotting the academic classes. The students were supported by some teachers too. #11. 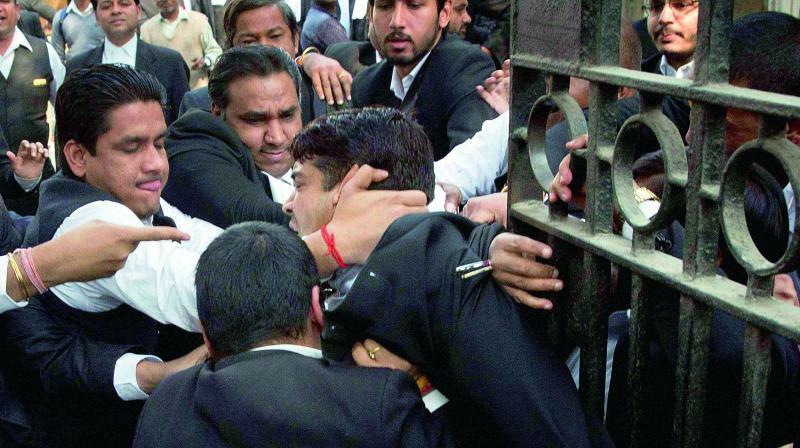 On the 14th of February, Kanhaiya Kumar was to be presented at the Patiala House court after his arrest. His supporters were at the court when they were met with violence from a mob. The mob attacked anyone and everyone irrespective of whether they supported Kanhaiya Kumar or not. In this violence, some journalists were also injured. Source *** Some points are sourced from here and the featured image is sourced from here. Hello There. I discovered your blog using msn. This is a really smartly written article. I’ll be sure to bookmark it and come back to read extra of your useful information. Thank you for the post. I’ll certainly return. lovers but this article is truly a pleasant paragraph, ensure that is stays up. to read through posts, but this webpage gives feature based content. and lastly got the courage to just give you a shout out from Houston Texas! Just desired to mention maintain the fantastic job! my problem. Might be that is you! Getting a look forward to search you. There may be definately a good deal to find out about this subject. I really like all of the points you possess made. Simply wanna remark on few general things, The website layout is perfect, the content material is rattling great. “We can only learn to love by loving.” by Iris Murdoch. Currently I am just ready to complete my breakfast, afterward having my breakfast coming yet again to read further news. I am just genuinely grateful on the owner of this website that has shared this great paragraph at at the moment. I used to be recommended this blog by my cousin. I am not sure whether this post is authored by him as nobody else know such detailed about my problem. Fantastic site. A lot of useful info here. I am just sending it to a number of pals ans also sharing in delicious. Many thanks for the good writeup. It in reality was a amusement account it. i will present in college. this type of. Additionally, the blog loads very fast for me on Internet explorer. out of this paragraph as well as from our argument made currently. I simply couldn’t depart your website before suggesting that I extremely enjoyed the usual info an individual provide on your visitors? Is going to be back frequently to inspect new posts. Hello to all, since I am genuinely keen of reading this webpage’s post to be updated on a regular basis. I’m amazed, I have got to admit. Seldom do you come across a blog that’s both equally educative and interesting, and without a doubt, you’ve hit the nail around the head. Your means of describing everything in this post is genuinely pleasant, everybody have the capacity to effortlessly understand it, Thanks a great deal. feels too complex and very large for me personally. I will immediately seize your rss as I can’t to find your email subscription hyperlink or newsletter service. Do you’ve any? Please permit me know in order that I may just subscribe. Thanks. site, how can i subscribe for any blog web site? I simply want to mention I am very new to blogs and seriously loved your web-site. More than likely I’m going to bookmark your blog post . You surely have terrific writings. Thanks a bunch for sharing your web site. I just want to tell you that I’m beginner to blogs and definitely loved you’re blog site. Almost certainly I’m planning to bookmark your blog . You certainly come with impressive articles and reviews. With thanks for sharing your website. I simply want to mention I am new to blogs and seriously enjoyed this website. Almost certainly I’m planning to bookmark your blog post . You really come with beneficial articles and reviews. Thanks a lot for sharing with us your web-site. I simply want to say I am just all new to blogging and site-building and honestly savored you’re web-site. More than likely I’m want to bookmark your site . You absolutely come with outstanding writings. Cheers for revealing your web page. The article has truly peaked my interest. I will take a note of your blog and keep checking for new information about once a week. center yourself and clear your feelings prior to writing. I am going to immediately grasp your feed when i are unable to find your email subscription link or e-newsletter service. head. The problem is a thing that too few people are speaking intelligently about. something in regards to this.